The newest Star Trek movie is a load of fun and was clearly meant to be. Watching the special features, you find that to entertain was the filmmakers' only objective in mind (beside making money, of course). 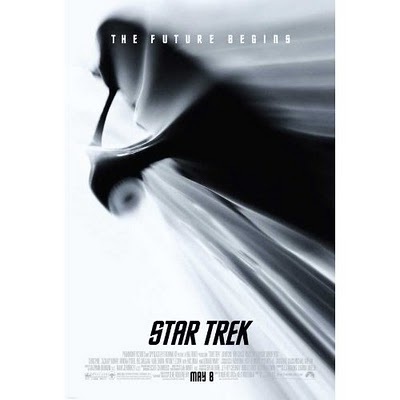 As the 11th film, Star Trek is actually a prequel to the other movies and the TV series. The story basically highlights the early adventures of Captain Kirk, Spock, Uhura, Bones, Chekhov, Sulu and the rest of the Enterprise crew. James Tiberius Kirk is in his early 20s when he meets Captain Pike, who encourages him to follow in the footsteps of his father and join Starfleet. On the planet Vulcan, Spock is discriminated against because he has a human mother. When his heritage is openly called a weakness, he decides it wouldn't a logical action to support his own species, and instead leaves his planet to join Starfleet. Fate brings him and Kirk together, and they don't immediately get along. Kirk and and his new friend, the cynical "Bones" McCoy, ascribe him a nickname, "pointy-eared b___d". The plot moves quickly, and after five years of training, Kirk and the rest are suddenly called upon to investigate a storm above Vulcan. The storm is actually associated with a time-travelling Romulan, Nero, who has come from the future through a black hole to take revenge on Spock, whom we learn he wrongly blames for the destruction of his planet, Romulus. In a way, it's not at all surprising that J.J. Abrams, the creator of the hit TV series Lost, famed for its confusing time-travelling and plot twists, directed the movie. There are a few problems with the script. At times, the young members of Starfleet don't seem to act like the characters from the original movies and they end up doing and saying stupid things their older versions would never be responsible for. One really lame part is when Neytiri - excuse me - Uhura kisses Spock after he's had a fight with Kirk. In this film, Spock is shown as a logical Vulcan, but he is capable of feeling emotions because of his human mother. Still, no way, no how would the real Spock ever be found making out with a human, or anyone else for that matter. I was more comfortable watching Neytiri kiss Jake. Anyway, the script is flawed, but not necessarily stupid, and the relationships between the characters, although not always resembling those of the original characters, are well developed. I do believe there were problems in the casting department. Most of the actors look nothing like the old characters, particularly Chris Pine as Kirk, whoever played Scotty, and Neytiri as you-know-who. To be fair, Zachary Quinto was wonderfully cast as Spock (and he probably cost a heck of a lot of money too). John Cho could pass as Sulu. Karl Urban looks nothing like Deforest Kelley. Leonard Nimoy is delightful, kind-of reprising his role as Spock Prime, the future Spock involved with Nero. The special effects are quite phenomenal and if Avatar wasn't released the same year, I bet they would have won a couple awards. The movie's not hyperviolent either, and other than some scattered bits of language and a few scary scenes, it's mostly family-friendly. It's a bit of a shame that the film uses a lot of the "shaky-camera technique" which makes it very hard to see the action at pivotal moments. The classics had it too. The camera is - I mean - the U.S.S Enterprise is shaking!!! Overall, the film is very entertaining, and a fine tribute to the classics. To sum it up in one sentence: Star Trek is visually phenomenal, but it's missing the classic heroes and themes of friendship that the old series had. Although I'm not by any means dissuading you from seeing it. P.S. Not sure how J.J. explains what happened to Vulcan, because the planet is there in Star Trek 3 and ST4. 2012 update: The movie actually makes a considerable effort to be philosophical with Spock's character, designing an overarching theme about logic and how it should be complemented with emotion. I'm not saying this picture is on the same level as Batman Begins or The Dark Knight in terms of weighty themes, but Star Trek encourages the viewer to think about its characters for several hours after the movie ends. Sci-fi week – Neytiri at the "National Parks"